Take the Top Down on Your Jeep | Holzhauer Motors Ltd. The Jeep Gladiator takes you one step beyond the traditional Jeep experience. It has the overall design of a Jeep Wrangler with a few additions that are taken from the design of a truck. This is a vehicle that has a removable top and doors to give you the open air experience while on the road and also gives you the storage that you would find in a pickup truck. 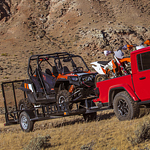 The Gladiator can tow several thousand pounds, making it fun to have so that you can haul almost any other type of toy wherever you travel. The sturdy tires keep you on the road while allowing for driving over multiple types of terrain. All of the details on the inside of the Gladiator have been updated to include a larger touchscreen and seats that are trimmed in leather. Holzhauer Motors Ltd. can assist in setting up your Android Auto features that are in the vehicle as well.